The Overhead Smash: Regulation adds to overhead, and higher overhead crowds out smaller competitors. Gumming Up the Works: Bigger companies are often saddled by inertia, meaning robust competition is a threat; hence Big Business seeks regulations that stultify the economy to hold back smaller competitors. The Confidence Game: Government regulation grants an air of legitimacy to businesses, often beyond what is warranted. [As] the Democrats' presidential nominee, Obama rallied behind Bush's bailout even while attacking the president� "Any politician would have done the same," Obama's defenders argue. And to a large extent, they're right, In fall 2008, many conservatives embraced radical Big Government. Obama, McCain and Bush all waved the bailout flag. They created the $700 billion, open-ended TARP bill�. Think about Obama's campaign-season attack: "This is a final verdict on 8 years of failed economic policies promoted by George Bush, supported by Senator McCain: a theory that basically says that we can shred regulations and consumer protections and give more and more to the most, and somehow prosperity will trickle down." Obama's plan sounds the same: bail out bankers and investors with taxpayer money, and hope that helps the broader economy. 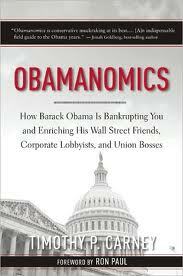 Would the author have written this same book and called it "McCainomics" had the 2008 election gone the other way? Maybe -- his book outlines the libertarian economic viewpoint, even though he's a supporter of the Republican Party (he calls himself a "populist libertarian", p. 231). So we can't say for sure how the author would have interpreted McCain -- but we can see a hint from the book's Foreword. Rep. Ron Paul writes the foreword, shortly just after losing the 2008 GOP primary to McCain, and three years before running for president again and bashing both parties' handling of the economy. In summary, this book outlines an important Republican attack on Obama's economic policies. But Mitt Romney beat Ron Paul in the 2012 primaries --- so this viewpoint is not the dominant mainstream Republican attack on Obama. Barack Obama: 2007 bill: discount contraceptives at college health clinics. George W. Bush: OpEd: Great Wall Street Bailout got tank of state rolling. George W. Bush: OpEd: $700B bailout borrows from future taxpayers. Ron Paul: Bailout confiscates productive money for failing companies. Timothy Geithner: Regulation should balance efficiency and stability. Barack Obama: Special interests dominate day-to-day legislative activity. Barack Obama: OpEd: Wall Street wealth comes from increasing gov't role. Ron Paul: Typical lobbyists champion corporatism over free markets. Ron Paul: The Fed acts as everyday corporate welfare. Al Gore: Science is settled on global warming. Barack Obama: 2006: FutureGen is the future of coal, with carbon capture. Barack Obama: Cap-and-trade: lower CO2 levels by fees on carbon emissions. Barack Obama: OpEd: cap-and-trade credit allotment is corporate welfare. Barack Obama: OpEd: Green jobs are just subsidies for selected industries. Jared Polis: Big Oil fights overwhelming evidence of global warming. John Dingell: Without controlling carbon emission, Big Oil & Big Coal win. Lynn Woolsey: Without controlling carbon emission, Big Oil & Big Coal win. Pete Stark: Global warming bill subsidizes fossil fuel industry. Spencer Abraham: 2003 FutureGen initiative: coal with carbon capture. Barack Obama: 2009: Expanded SCHIP by loosening eligibility standards. Bill Richardson: 2007: Pushed for New Mexico universal health insurance. George W. Bush: 2007: Vetoed SCHIP expansion; Obama later expanded it. Ron Paul: Insurers promote ObamaCare's giant expansion of government. Ron Paul: Individual mandate is back door to national health insurance. Barack Obama: OpEd: Big Business gave more to Obama than McCain. Bill Richardson: Withdrew nomination under scandal from $1.5M donations. Rahm Emanuel: OpEd: Won 2002 House race with help of Chicago Daley Machine. Ron Paul: 2008 "money bomb": $4M and $6M donations in one day.